The Koan series hosted by Jazz.Coop has over the last 3 years showcased artists from across the Newcastle’s no-genre improvisation scene and brought in acclaimed out of Toon guests. The series concludes with Koan Liberation a fitting celebration featuring the virtuoso ground breaking Welsh harpist Rhodri Davies, the wildly imaginative KLEEVEX, the master of solo looping experimental soundscaping bass Ojay and the wellspring of the Geordie improv scene The Newcastle Improvisers. Rhodri Davies was born in 1971 and lives in Swansea, South Wales. He plays harp, electric harp, live-electronics and builds wind, water, ice, dry ice and fire harp installations. He has released four solo albums: Trem, Over Shadows, Wound Response and An Air Swept Clean of All Distance. His regular groups include: HEN OGLEDD, Cranc, and a duo with John Butcher, The Sealed Knot, Common Objects and a trio with John Tilbury and Michael Duch. 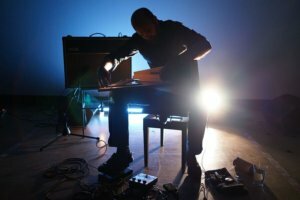 He has worked with the following artists: David Sylvian, Jenny Hval, Derek Bailey, Mark Fell, Kahimi Karie, Laura Cannell, Lina Lapelyte, Sachiko M, Bill Orcutt, Jim O’Rourke, Christian Marclay and David Toop. In 2008 he collaborated with the visual artist Gustav Metzger on ‘Self-cancellation’, a large-scale audio-visual collaboration in London and Glasgow. New pieces for solo harp have been composed for him by: Eliane Radigue, Philip Corner, Phill Niblock, Ben Patterson, Christian Wolff, Alison Knowles, Mieko Shiomi and Yasunao Tone. In 2012 he was the recipient of the Foundation for Contemporary Arts, Grants to Artists Award, since 2016 he is a Chapter Associate Artist and in 2017 he received a Creative Wales Award. He is a co-organiser of the NAWR concert series in Swansea. KLEEVEX is the duo of Faye MacCalman reeds (‘Archipelago’ https://archipelagojam.bandcamp.com) and Gwilly Edmondez voice/dictaphones (‘YEAH YOU’, https://boomkat.com/products/krutch). Their music pares down to their most candid stitch in order to address the situation as it is during a multiple now. Flitting between the sounds, howls and words of ridiculous squabbley microphone and free singing reeds skrunk, they explore the rawness of now. Ojay is a solo bass player, a looper and experimental soundscaper who drifts in and out of funky psychedelia with ease. Working with or without beats he layers his bass through a variety of effect pedals to create shifting soundscapes that seemingly always attempt to defy genre. Focusing on improvisation Ojay has busked on the streets of Newcastle for over ten years, sharing his unique funky filmic sounds and has become a well known and loved addition to the vibe of the city centre where he is lovingly known as ‘The Awesome Bass Guy’. Ojay regularly hosts a monthly improvisation jam night at Bar Loco, Newcastle as well as perfoming solo gigs up and down the country in venues and at festivals. He also teaches bass guitar, has facilitated music workshops for children and adults. The Newcastle Improvisers are musicians from Newcastle’s rich no genre improvisation communities (Improvisers Workshop, Cooking with Three) and will respond to the Koan 8 theme of Liberation emphasising quiet restraint, space and distinction within collaboration. Expect the drawn out exploration of subtle textures and the rise and fall of gesture. The Improvisers Workshop is supported by Jazz North East developing and sustaining improv practice over the last three years. Cooking With Three is an independent collaborative mixed-media, free-improv ensemble. It’s a great pleasure to once again have Koan programme a night of improvisation at ‘Newcastle Festival of Jazz and Improvised Music’ 2018.